By the late 19th century the Victorians were using more muted colours to decorate their homes. The popular bright colours of the middle of the century such as scarlet, magenta and crimson had been viewed by candle or fire light, but after the invention of gas and electric lamps the colours looked garish. 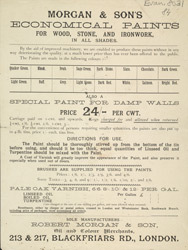 It became fashionable to use more muted colours such as 'buff' and 'slate'. It is interesting to see how fashions change, people painting their houses today would probably not choose to buy a paint named 'drab'!